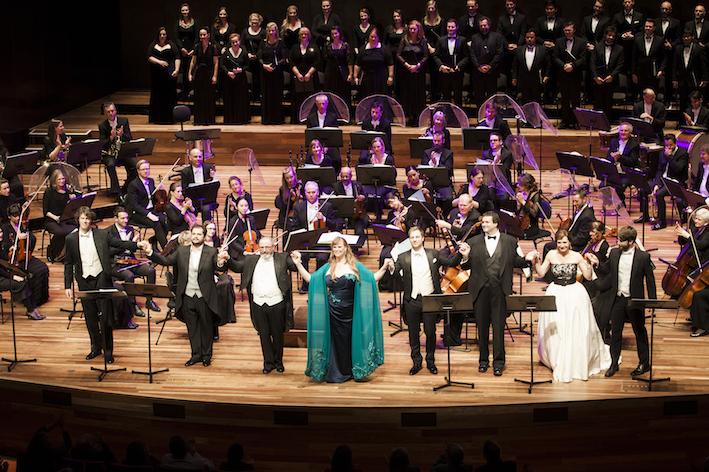 A triumphant success, Victorian Opera’s one-night concert presentation of I Puritani was a finely honed musical showcase focused on the splendour and beauty of the voice. 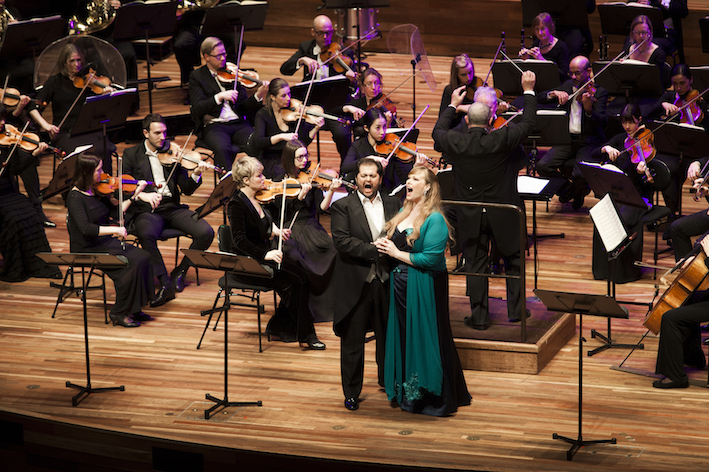 Freed from the trappings of a fully staged production, Bellini’s gloriously melodious music more than stood up to having the spotlight shone directly on orchestra, chorus and soloists. Maestro Richard Mills prepared a highly polished, evenly balanced performance of the all too rarely staged opera in which each musical element blended perfectly. Performing on stage, Orchestra Victoria again proved to be not only capable of expert operatic accompaniment but also a visually appealing stage orchestra. The assembled Chorus sang with focus and precision to create a noticeably unified sound. Male chorus brought controlled vigour to Bellini’s military passages, and full choral work was wonderfully appealing in its balance of power and beauty. The dark copper walls of the Hamer Hall stage gave a decent impression of the Puritan’s fortress setting. Clarity of the plot was aided through free programs and the welcome sight of big, clear surtitles. 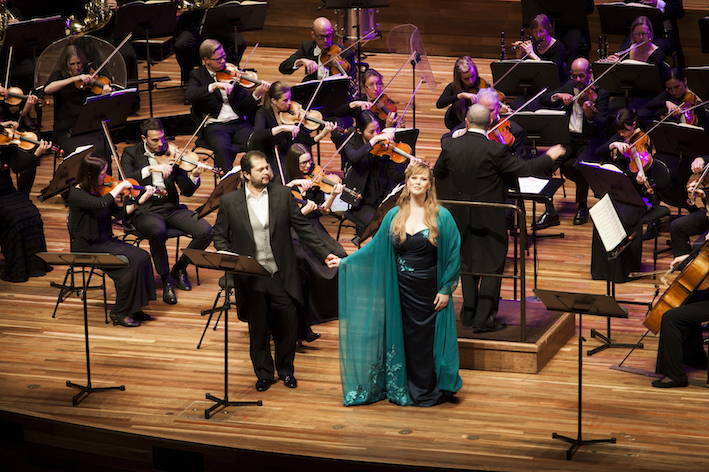 The focal point of the concert was the appearance of visiting artists Jessica Pratt and Celso Andres Albelo Hernandez, and these stars certainly did not disappoint, wowing the audience with dazzling vocal artistry. English soprano Pratt, who lived in Australia from age 12, found ample scope to display her astounding vocal talents in the central role of Elvira. If Pratt’s fiorature has just a slight lack of definition, it is more than made up for in the accuracy and fullness of tone in her middle and upper register. Pratt gave an effortlessly commanding performance that will long be remembered by all those in attendance. From her first appearance in gently blended quintet “O di Cromvell guerrieri” (sung onstage), Pratt expertly portrayed Elvira’s emotional journey through joy, heartbreak, madness and recovery. As Elvira prepared for her wedding, Pratt delivered the delightful aria “Son vergin vezzosa,” before moving on to the rapid encroach of madness after Elvira asks “Dov’è Arturo?” only to find herself jilted at the altar. 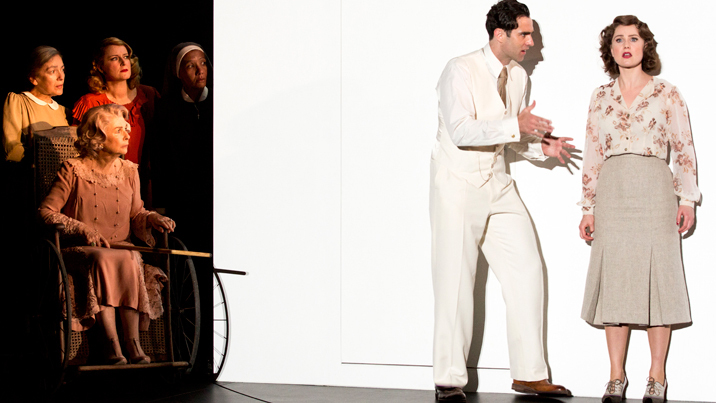 In act two’s famous mad scene, Pratt moves through “Qui la voce … Vien, diletto” in an electrifying display of passionate but expertly controlled singing. Pratt’s exquisite talent with pianissimi in altissimo is but one feature that brought the house down in this extraordinary sequence. A return to the stage for an extra bow was more than warranted, but Pratt had disappeared in to the wings and Mills eventually had to move on with the show. Pratt’s thorough preparation gave her a familiarity with the role that allowed her to position herself away from the music stands to perform Elvira’s key scenes. A generous colleague and gifted actress, Pratt brought a distinct warmth and presence to the role, interacting with her castmates so as to enhance the storytelling of the concert performance. Pratt contrasted a cheerfully bright coral gown with a dark verdant green ensemble to bring a touch of glamour to the evening. Rising Spanish tenor Hernandez began with a momentary hint of nerves before moving on with great confidence to thoroughly enjoy the evening. In Arturo’s first big aria “A te, o caro,” Hernandez displayed the warmth of his voice as well as his gift for powerful fortissimo singing. 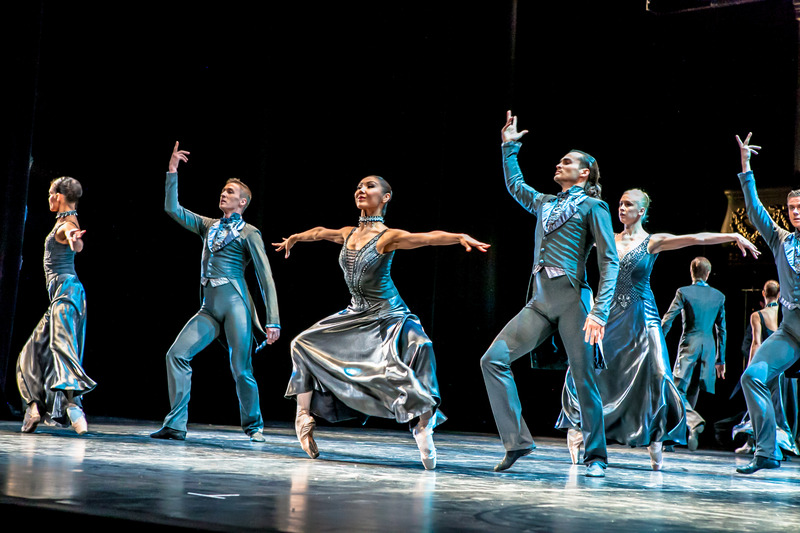 This warmth blossomed into tender, highly romantic tones in the returning Arturo’s extended sequence of arias in act three. To follow such an incredible mad scene was no small task, but Hernandez wowed the audience with his unflagging vocal power and incredible high notes. He managed the high F in full voice in “Credeasi, misera,” also confidently ending the final duet with Pratt on the interpolated high C.
Emerging Australian baritone Nathan Lay more than held his own in this highly experienced company, presenting himself with poise and charisma. Lay delivered the evening’s first aria, “Ah! Per sempre …Bel sogno beato,” with such appealing tenderness that he almost seemed to be the romantic lead, rather than the rival suitor, Sir Riccardo Forth. Lay’s singing and acting talents, along with his alluring charm, are sure to see him in high demand before long. 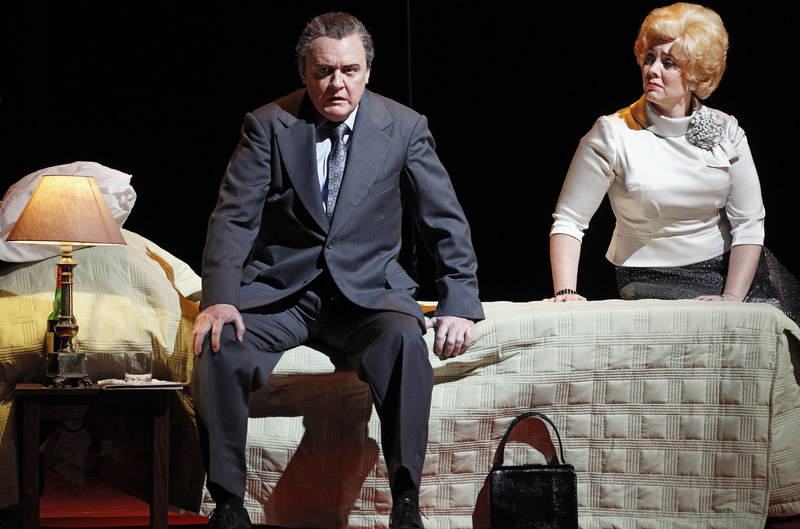 New Zealand born bass Paul Whelan projected an imposing stature as Elvira’s uncle Sir Giorgio Valton. Whelan seemed to almost run out of voice during act two opening aria “Cinta di fiori” before recovering sufficiently to continue. While Lay’s freshness was an asset, stirring act two duet “Suoni la tromba” was not as thrilling as it might have been due to a somewhat less lustrous contribution from Whelan. Powerful tenor Carlos E. Bárcenas contributed to the evening’s attractive singing with some featured moments in act one as Sir Bruno Robertson, compatriot of Riccardo. 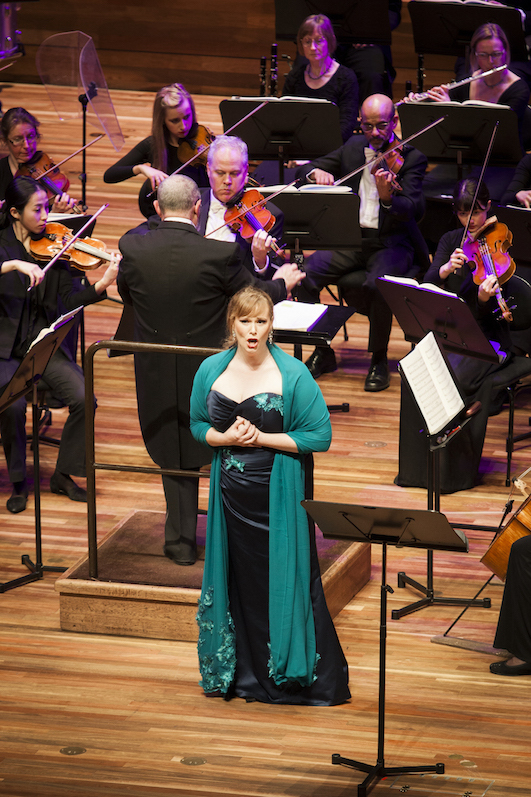 Likewise, mezzo-soprano Tania Ferris sang with supple flair in the supporting role of Enrichetta, widow of King Charles I. Bass Jeremy Kleeman, although a little young to play Elvira’s father Lord Gualtiero Valton, gave reliably strong support. This was an unforgettable evening of expertly performed, truly beautiful music. 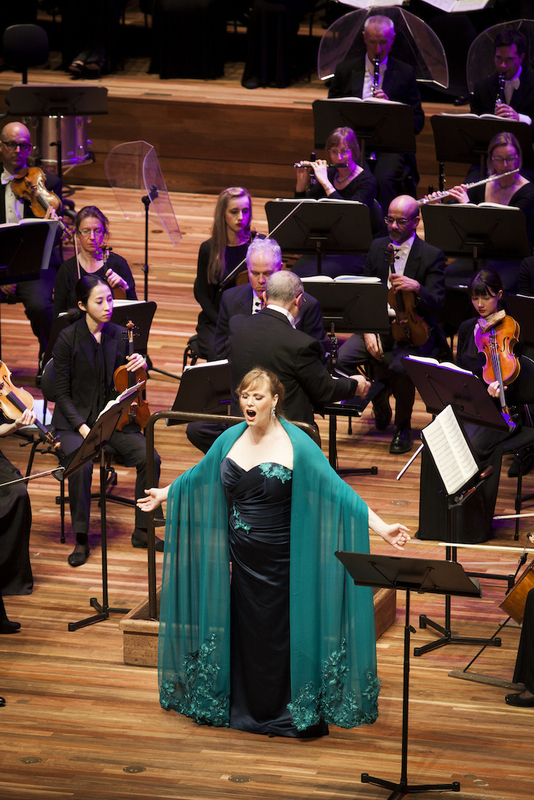 It is hard to imagine how Victorian Opera will top this next year, but let us all hope that they will try. Good Lord! –I can only hope that somehow this apparently astonishing performance was recorded, for the rest of us to someday enjoy! I would love this to be true Bill, but unfortunately I don’t this the performance was recorded. Hopefully we see these singers on stage in Australia again soon though! Agreed…this was truly an unforgettable performance with dazzling display of vocal artistry. Not often do we get to experience such a commanding performance “downunder”. Bel canto indeed, felt very privileged to have been in the audience. Stunning!!! Thanks Erica. I have my fingers crossed that Victorian Opera will try something in the realm of this concert next year. We can only dream of another such night of operatic splendour!